Moroso's air pan kits feature a smoothly radiused flange to allow smoother air entry into your carburetor. Each pan features a two-piece bottom for simple customizing to your exact needs. Seals tightly to hood with the included fire resistant foam. 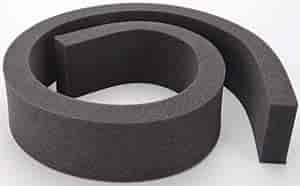 97070 - Moroso Air Pan is rated 4.8 out of 5 by 4. Rated 4 out of 5 by Purplehaze from Good stuff Good foam works great easly cut and trimed with a electric knife. Used it to fab a hood to carb air pan seal, worked out great. Only reason for four stars is its realy expensive.